If I were to come back as a trout I know exactly where I’d like to live. It’s in a secret corner of Normandy in France on a beautiful stretch of a river called the Andelle. And in particular, a one mile private stretch flowing through grounds of the magnificent estate of Manoir Malvoisine. 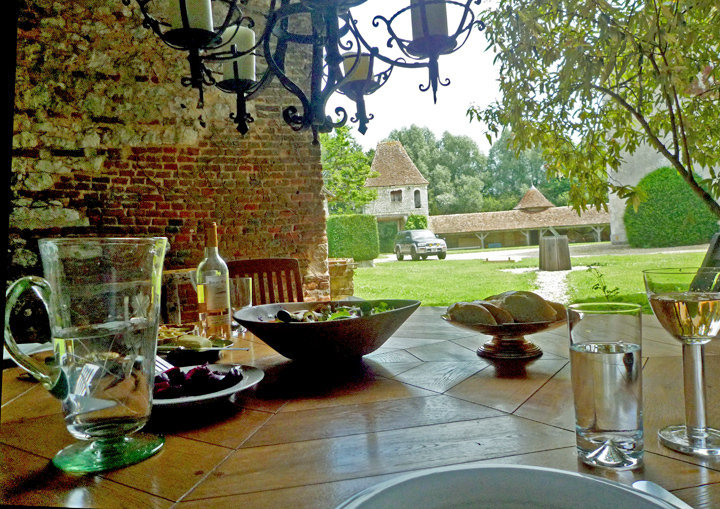 Malvoisine is a stunning, fortified manor house with a long and tumultuous history and situated on the banks on the Andelle. It’s appearance suggests little has changed since the 12th century when it was first mentioned as a “Fief de Haubert’ and connected to the king of France. 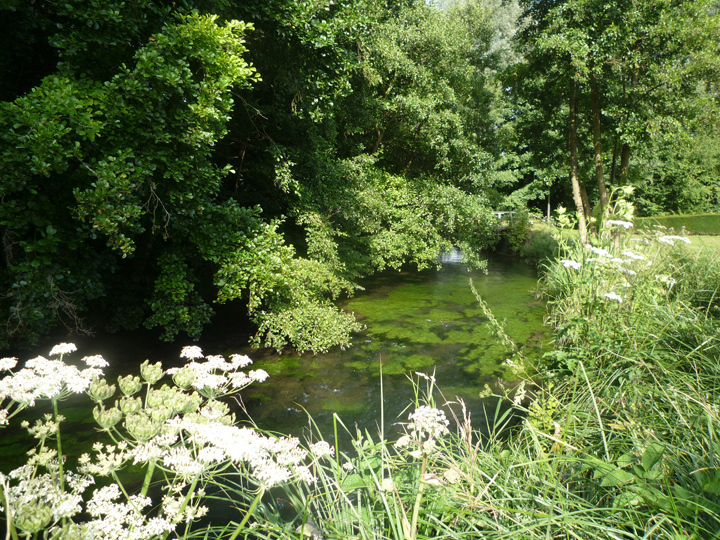 The Andelle is a true chalk stream, which being fed by underground aquifers rarely floods or dries up. This private one-mile stretch has been lost in time and retains much of the ancient landscape, with the manoir itself situated midway and making a magnificent visual contribution to the wild setting. Before the current owners, Adrian and Hedy Thomson, bought the estate three years ago it had been the property of a Belgian aristocrat who over the previous thirty years had only ever used it as a hunting lodge to pursue his passion for wild game. In all that time the river was never fished and the original strain of wild trout exist to this day because stocking was never necessary or undertaken. The Andelle river is high in the pantheon of French trout streams, not least because it was a favourite of legendary French fisherman, Charles Ritz, scion of the original Ritz Hotel family: innovative fly tyer, rod maker of international repute in the 30’s and 40’s and oft times fishing companion to Frank Sawyer, the doyen of English nymph fishing. This particular stretch of L’Andelle has its own special place in more recent history as a secret meeting place between Churchill and Eisenhower (both lovers of fly fishing) after the success of the Normandy landings. 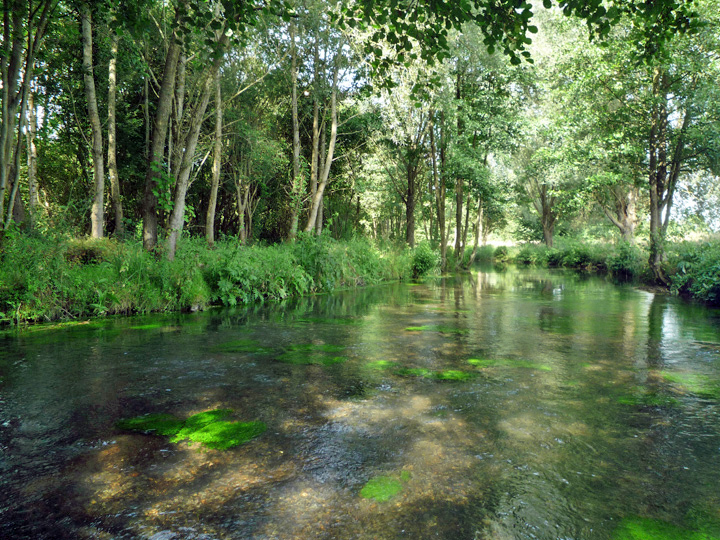 The Andelle, being a natural river with very little intervention from man, offers technically challenging fly-fishing for it’s famous wild brown trout, which are indigenous to the waters. A third of the river flows through wetlands of dense alder and willow where single-bank access has been opened. The remaining double-bank stretch meanders through water meadows where wild flowers and grasses line the margins. 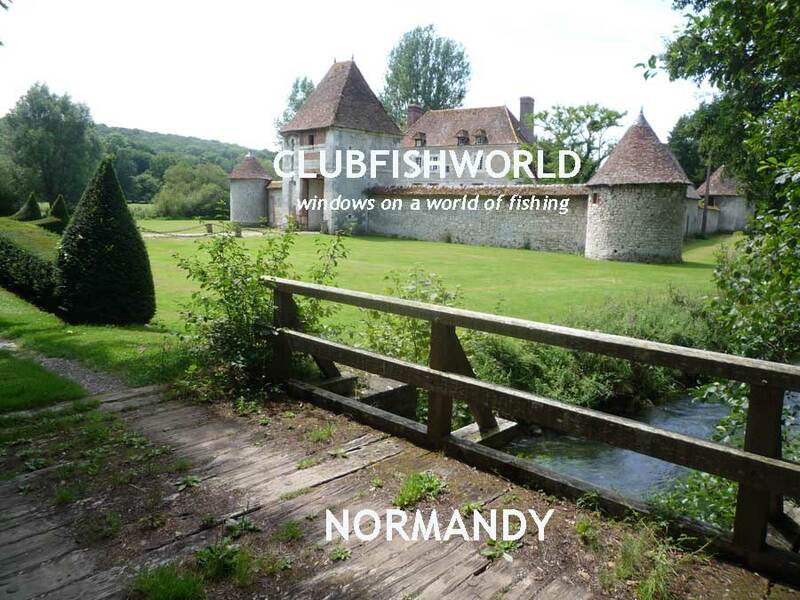 The manoir is also a member of the U.K.’s Wild Trout Trust whose advice shapes the management and improvement of the river. To support the initiative, there is a catch and release policy where the use of barbless hooks is mandatory. I was fortunate enough to be introduced to Malvoisine by a fishing pal of mine, Mike Collins, who found it on the Internet whilst searching for a first night stopover on a drive down to Italy. His waders had barely left the water before phoning me to extol the virtues of this hidden gem. And the irony is I only live an hour away in lower Normandy and had never heard of Malvoisine. But it is their first season providing fly-fishing as a compliment to the wonderful accommodation on offer and does it takes time for word to spread. I took the opportunity of visiting Malvoisine in early august by making a small detour on my way from Calais to our Normandy home. The moment you cross the bridge straddling the crystal clear stream and catch first sight of the magnificent turreted manoir, you can’t help knowing you’re in for a special day. The bankside paths are well tended but bearded by managed wild growth affording camouflage for the angler and valuable insect life for the trout. Overhangs are dotted along the various stretches, that although presenting mild difficulties in certain areas, pale by comparison to the advantages of natural cover for trout and in the certainty for anglers that they are concealed from their prey. The stretches themselves are varied in width, depth, and density of surrounding foliage. But nowhere is inaccessible and all can be waded with the minimum of effort. Mike had told me that it bore more than a passing resemblance to the Wiltshire Wildlife Trust stretch of the Wylyle we had fished together earlier in the year, and he was spot on - which believe me, is high praise indeed. The only difference being Malvoisine is not a grayling water but I’m convinced it could be: the quality and oxygenation of the water plus abundant gravel flats seems to me, ideal. I’d arrived around midday to be greeted by the sight of owners, Ardian and Hedy ensconced at a bankside table. And no sooner my hand freed from Adrian’s grip than it was filled with a glass of cold white wine; the wine and conversation flowing freely in tandem for the next hour and half. With the august sun high overhead and temperature touching 80 degrees, it didn’t make for ideal fishing conditions so we proceeded to walk the down-stream stretch, spotting the various lies and the odd lurking trout bold enough to show his colours in the dappled overhead light of the more shaded areas. A delightful lunch followed of home grown products from their kitchen garden, prepared as salads, home made quiches and fruit tarts, and again washed down with a delightfully refreshing white wine. I didn’t start fishing till around 4 pm after we’d walked the upstream stretch. The company had been far too convivial, and after all, what is fishing about if not to enjoy new acquaintances and soak up the knowledge they have to impart of their waters before taking to the fly. The down stream stretch held the broadest and probably the most varied of the waters. At one point It splits in two to create interesting islands inter-connected by bridges designed and built by Adrian himself (he used to design and build yachts) Throughout, the weed growth is prolific, providing great cover and food - this, testament to the excellent quality of water that is constantly monitored and managed by the local water authorities. The most evident and prolific of flies on view were sulpher duns but they tempted few risers, so it was a question of prospecting weed beds and alongside the bank’s deeper undercuts. I took 2 lovely butter-flanked brownies in the lower stretch. Then rose and missed two more on the upper before I had to call it a day at around 6.30. Unfortunately I couldn’t stay on for prime time - between eight and ten in the evening – I was expected at home for a family dinner. But on the evidence of my limited time there, especially given the evidence of the returns book I’d filled in at the end of my day (fish up 2.5 lbs and a more than decent average catch rate) it’s certainly a place I will revisit next season with ample time to spend. Malvoisine is an ideal place to go for a short break, either with a fishing pal or on a romantic weekend with a loved one; and even as a stopping off point on a journey to Paris or further afield in France. The setting is stunning, the accommodation very comfortable, the hospitality exceptionally warm and convivial, and the food, prepared by Hedy, is excellent. And as the fishing is restricted to guests staying at the Manoir, in all probability you’ll have the river to yourself. Added benefits are that Malvoisine is situated an equidistant thirty minutes drive between Monet’s world famous garden at Giverny and the delights of Rouen, France’s former medieval capital. It is also only one hour by motorway to Paris. All in all, a perfect little paradise for both trout and fishers alike. Copyright © Clubfish World. All photographs & text.